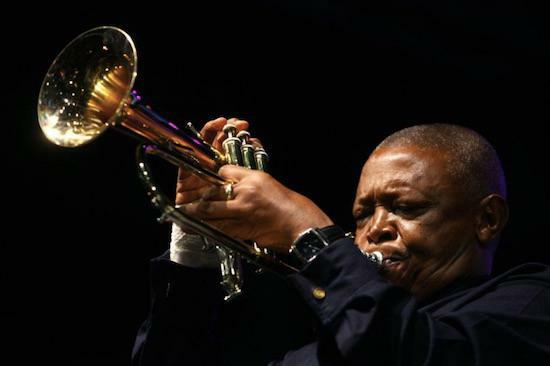 Hugh Masekela, the South African jazz trumpeter and anti-apartheid activist, has died at home in Johannesburg aged 78. Born in Witbank, east of Johannesburg, on 4 April 1939, Masekela was inspired to play jazz after watching a film about Bix Beiderbecke, and was given his first trumpet by anti-apartheid activist Father Trevor Huddleston. Along with Abdullah Ibrahim and others, he formed the Jazz Epistles in 1959 and they became the first African jazz ensemble to record an album. Masekela played played at Monterey Pop in 1967, alongside Jimi Hendrix, Janis Joplin and Otis Redding. He and producer Stewart Levine organised the Zaire 74 festival in Kinshasa, where James Brown, Miriam Makeba and Bill Withers played to 80,000 people in Kinshasa. He played with Paul Simon (and supported Simon’s work with Ladysmith Black Mambazo and other South African musicians on Graceland). In 1980, he set up a mobile recording studio in Botswana, just over the border from South Africa, and founded the Botswana International School of Music. He wrote Makeba’s great staple song ‘Soweto Blues’, and his 1987 hit ‘Bring Him Back Home’ became part of the fight for the release of Nelson Mandela.